A crowd of 562 was in attendance for Saturday night’s home opener for the Galion Graders at James D. Heddleson Field at Heise Park. A loss wasn’t enough to dampen the enthusiasm Saturday night in the first-ever home game of the Galion Graders at James D. Heddleson Field at Heise Park. Officials affiliated with the team were pleased by the 526 people who turned out for the game. In comparison, Galion’s first game Thursday at Licking County in Newark drew 120. “Months of work and volunteer efforts resulted in a nice community effort,” Galion Mayor Tom O’Leary said. 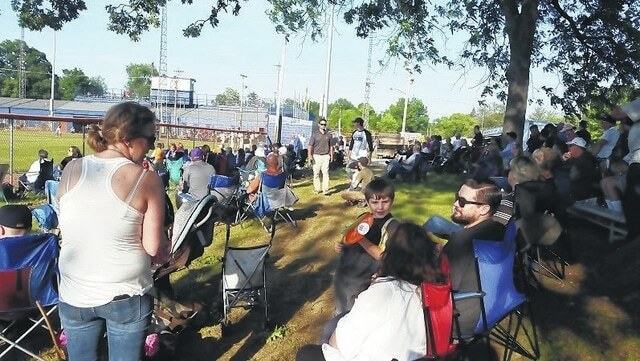 Crawford County Economic Development Coordinator Gary Frankhouse, who also serves as the team’s treasurer, was pleased with the turnout for the game. “We have unique concessions and a couple more fireworks shows scheduled this season,” he said, adding that the team is working on on-field promotions as well. In the stands, fans seemed happy to see the new team in action. “It’s good to see the local kids,” Galion resident Jeff Roberts said. “I came to see these guys play,” added their son, Caden, who got into the game free with his Galion Youth Baseball shirt. Garin O’Leary, the mayor’s nephew and a 1999 graduate of Galion High School, said he was there to support his family, which included cousin Mike O’Leary, the team’s general manager. Garin said he hopes the team will revitalize Galion and the surrounding community. At next-door Unckrich Stadium, John and Christine Deibig were among those who found a vantage point at the top of the stadium. The team had another home game scheduled Tuesday night and will play its next home game Friday against the Lorain County Ironmen.